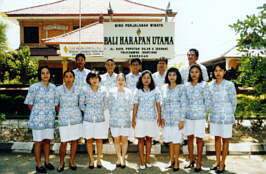 BALI HARAPAN UTAMA TOURS & TRAVEL (formerly Tejo Express Tours & Travel Bali), handling inbound tours FIT as well as GIT. Our sister company PT. 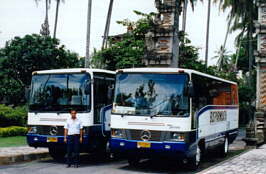 HARAPAN BALI TRANSPORT (Transportation Company) and PT. AQUANAUT NUSANTARA specialist in water sport activities. With 3 company under one management, we are sure that we could offer the best service to your valued client. We at Bali Harapan Utama Tours & Travel have strong background of experiences in handling regular tour, special interest as well incentive and conference. We sincerely hope that this information will help you inpreparing you and your clients to visit Indonesia especially "The Island of the Gods - Bali". Whatever you are in business on leisure contract us, we hope to hear from you soon.